Super-X ammunition is hard-hitting and reliable. From deer to upland birds to target shooting and self-defense, there is a Super-X product for almost every quarry. 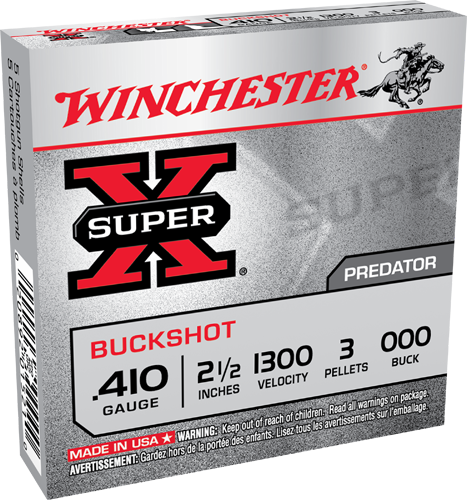 First introduced in 1922, Super-X ammunition delivers better and more dependable knock-down power. Made using precise manufacturing processes and high quality components, this ammunition has become the ammunition to rely and depend on for whatever your need. Super-X Shot-shells are hard-hitting and reliable. From deer to upland birds, there is a Super-X Shotshell for almost every quarry. Loaded with high quality components using precise manufacturing processes to provide consistent, reliable performance. You can trust these shells to deliver the performance in the field you've been looking for. Consistent, Dependable Performance. Exceptional Quality and Outstanding Performance. Time Proven Dependability. Powerful High Brass Performance: Long-range knock-down. One-Piece Hinged Wad: For consistent, tight patterns and reduced felt-recoil. Famous 209 Primer and Clean Burning Powder Reliable ignition and consistent velocity.